Leading up to this event I was a little nervous, not about making the distance I thought I had that in the bag but was nervous about the goals I had rolling around in my head. At some point in the week prior to this race I got the silly Idea that maybe I could do this race at a 12 Min / Mile pace. Yes, even though I had gone down to Weymouth 2 weeks previous…Man was I in for a surprise! 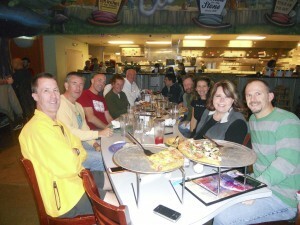 The night before the wife and I met with several of the runners at the Mellow Mushroom in S. Pines, We enjoyed each other’s company, swapped stories & made new friends. This would be the 1st time that my wife would get to meet other ultra-runners but I will have to save that for another post, :-). Once we finished dinner we all went our separate ways to start getting ready for the task at hand. I personally had not done any packing so it was off to put all my gear together and get in the bed….It’s going to be a long day tomorrow. Pre-race – Got up nice and early loaded my gear into the truck and off I went with little fanfare. Arrived at Weymouth Woods Nature Preserve around 6:30 to find my friend Rachel and Paul had already set up base camp & Rachel’s own personal aid station. As planned from the night before I tossed my gear box next to their table, mulled around for a little while then headed inside for the pre-race meeting. Meeting-Inside the nature preserve’s auditorium was very warm and with 75-100 people packed in there for the race meeting it was getting even warmer. Marie proceeded to tell us some information about the race and how the timing would be done. Then her husband spoke and the both emphasized that there are plenty of medical personal available if someone needed attending. They wished us a great race, directed us to the starting line and requested that we be there in about 10 min. Will and I went out and just enjoyed the trail. We were mindful of our speed but not really concerned about out. I was dressed very warmly and by the end was VERY happy to take of a couple of layers. The trail was in great condition and today looked like it was going to be a FAST day. 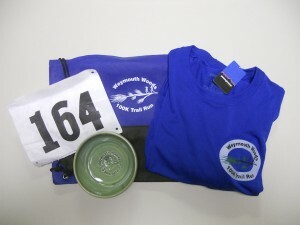 We go back to our personal aid station, removed some clothing, I grabbed my Nathan’s race vest and off we went. On the start of lap 2 we were feeling great and on top of the world. We ran this lap and I kept telling Will that it was a little too fast and I needed to slow down. Thankfully we slowed some. The next couple of laps Will fell into a little bit of a funk and through encouraging each other we pushed on through. We were keeping up with our food and hydration and felt really good. Not much changed through laps other than me getting worn out. At some point around miles 40 & 50 I had to stop and use a bathroom (#2) break and that put us quite a bit behind. At the start of lap 9 my wife showed up to crew me for the rest of the race. She teamed up with Rachel’s husband & her pacer to help figure out what I needed. It was wonderful to have here there and I am so very thankful for all the help everyone gave her! Here’s where things started to break down. My pacer Shawn showed up at the start of lap 10. Not feeling so great and quite tired we still took off down the trail head like rockets. Shawn proclaimed that we were running a whole lot stronger & faster than he expected us to be running by now. I told him I would like to keep a sub 12 Min pace while running be we are walking ALL the ups. LOL, even the flats looked like ups at this point. The more we continued on the worse I felt. Somewhere around lap 12 I gave in and had to sit down. At this point Will had come out of his funk and was looking pretty good. I figured that there was no reason for both our times to suffer for me not feeling well so, since I had Shawn, I sent Will on his way. Glad I did he ended up having a GREAT Race, Way to go man!! After that initial sit down it was like I was doomed. I felt like I was in and out of consciousness and was without a doubt walking / hiking with my eyes closes. I tried to eat, and everyone keep telling me that I need to drink but I just couldn’t bring myself to do it…. At each of the aid stations I would try to eat something, Grits, Saltine Crackers, Ginger Snaps. The last time around at the main aid station I asked Shanda to get a cup of soup cool off for me so I could down it when I came in before Lap 12. As I came into the station I was in ROUGH shape, I was sick to my stomach, dehydrated and was death marching…..It was not a good scene. As requested Shanda had my soup and some other food stuffs for me. I barely managed to get the soup down and started off to the 12th lap. All through the lap I would tell Shawn..”I have to sit down for 5 min”. He would agree, then the next think I knew he was saying, “Ok, get up, time’s up”…little did I know that the 5 min. I requested he actually only gave me about 2. Good for him, that was just what I needed!! About 9/10th of the way through the lap it happened. Explosive / projectile vomiting! UGH, I hate pukeing. Never mind puking in front of people AND in the middle of the race on the race course. After that I felt much better and we proceeded to finish the rest of laps 12 & 13. Final lap: As I sat at Rachel’s personal aid station trying to get down some vitamin water that Paul had suggested I couldn’t help but thinking I’m not going to make it. Starting to really crash again my wife knelt down in front of me and told me how proud she was of me and that I could do this. Well that must have been just what I needed, I gathered Shawn and off we went. 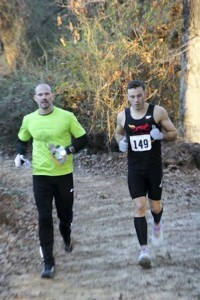 Shawn was on a mission to get me finished under the 15 hour mark as we power hiked the course. All along the way he would ask “You ok back there”, my response “NO!” , in return he would say “GOOD, Tough Love…Let’s keep going”. There would be no resting on this lap. Nothing but the power hiking and sipping on some NUUNS. We proceeded down the last hill to the really rooty section and I knew I was done. As soon as we cleared the roots I did what I thought was a run to the finish (all 100ft or so)……and I was done! YAY I did it. Not what I expected but I finished and I qualified. On my heels the whole time was Rachel, as soon as I heard them chanting and screaming from the woods on their preparation to the finish I would start yelling for her to run. Very excitedly she finished under the 15 hour time mark; we all hugged, told each other how great we did. 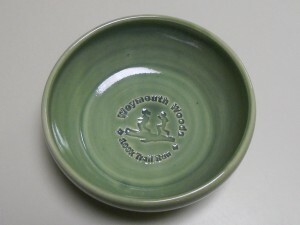 I gathered my finisher’s pottery bowl and poured myself into my truck and the wife drove me home. Great job sticking with it – sorry it was so rough towards the end. :s Hate to say it, but its good mental prep for U100. Least with Umstead u dont have to worry about the sand and roots 🙂 congrats on a well run race – see u at U100! Way to tough through that one. Without a doubt, Weymouth is a tough course taking a ton of concentration AND endurance. Amy is right . . . this was a PERFECT training run for Umstead . . . physically and more importantly mentally. You’re going to do GREAT!